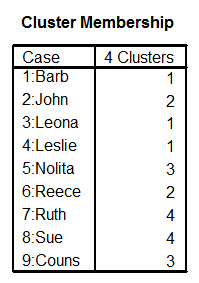 The purpose of cluster analysis is to categorize a set of objects, variables, or people by placing them into clusters based on their similarity or differences. It is a method for developing a taxonomy. If variables are clustered then it is like factor analysis although there are differences that will be demonstrated below. In fact, a correlation may used in cluster analysis. 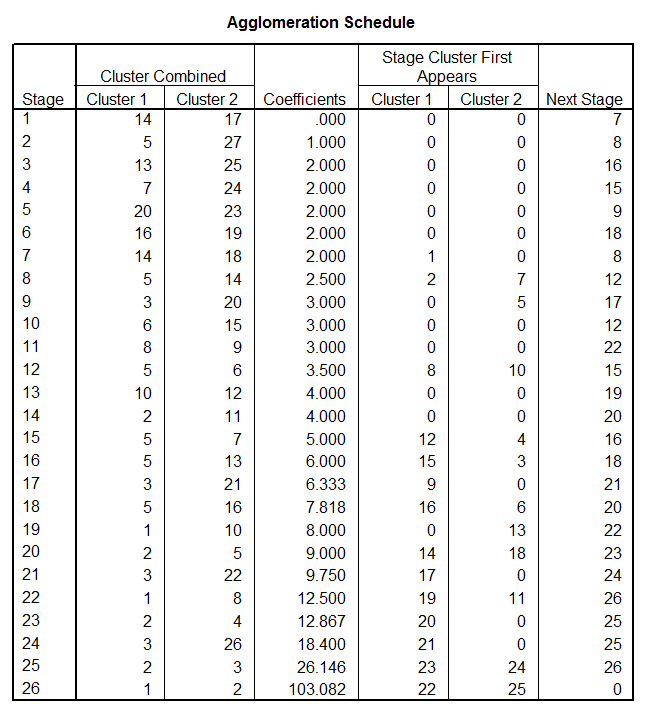 The questionnaire on the next page is used in this cluster analysis example. Like discriminant function, cluster analysis is a method of grouping individuals, or variables. In the first example individuals are clustered and in the second example variables are clustered. The same set of data is used in both examples. The difference between discriminant function and cluster analysis is that discriminant function the groups are known and the task is to identify the variables that will predict which group the individual should be assigned to, while in cluster analysis the groups are empirically derived from the variables. circle more than two. Try hard to circle only one. The next analysis request four clusters. Click on Data; Click on Transpose; Click on PERSONA; Click on delta to Variable Name; Select remaining variables; Click on delta to Variables; Click OK. SAVE AS pssstf18.sav. The purpose of this next section is twofold: (1) to demonstrate another method of the use of the statistics and (2) compare the various statistics methodologically. /keep= PERs TEST1 TEST2 TEST3 TEST4. In Frame CRSCOR16.LIS TEST1, TEST2, and TEST3 all correlate perfectly with each other, even though test 2 is negatively correlated with the other two. Test4 correlates zero with all three tests. 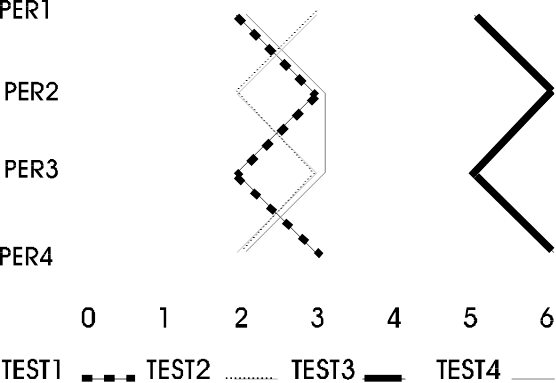 It can be seen in the graphic that the profiles of TEST1 and TEST3 are identical even though are separated in terms of distance. TEST2 is the mirror image of the other two. TEST4 although close in proximal distance to TEST1 and TEST2 is quite dissimilar in terms of the relative shape or profile. Factor analysis shows how this small set of variable can be summarized. It should be noted that there are not nearly enough variables in this set for what would be considered appropriate; there should be at a minimum 40 subjects to compute this analysis. The purpose of this example is to show the differential effects of factor analysis and cluster analysis. As indicated the two analysis are similar in that they both summarize the possible underlying characteristics of a set of variables thus simplifying and consequently obtaining more parsimony. However, the summarization process is somewhat different for the two processes and this demonstration is designed to show. TEST1, TEST2, and TEST3 form the first factor and TEST4 forms a factor of its own. Further, the first three variables are perfectly correlated with the first factor. However, TEST2 is negatively correlated with the factor. The relative weights are perfectly related. The cluster analysis is presented. It is necessary to invert the data in order for the analyses to be comparable as shown in Frame CLSDAT2.TXT. Frame CRSCLS7.SPS contains the jobstream and Frame CRSCLS7.LIS contains the output. /keep= ID PER1 PER2 PER3 PER4. 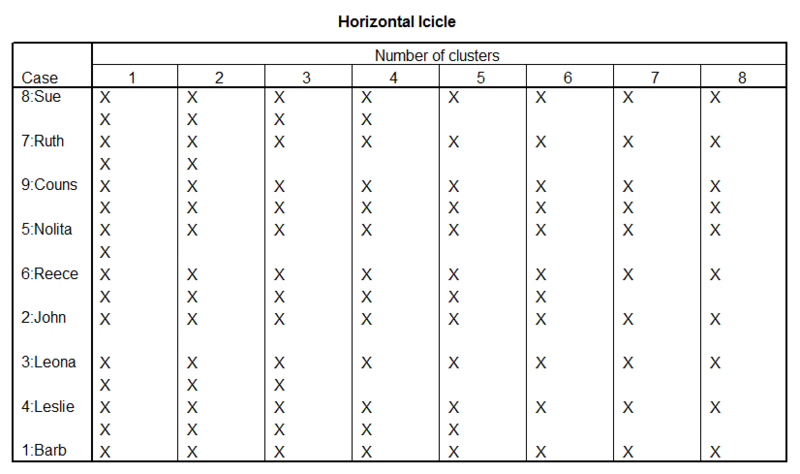 Note in the cluster analysis that there are also two clusters representing the four variables but they are constructed of different variables or tests than the factor analysis. TEST1, TEST2, and TEST4 make up cluster1 and TEST3 is in a cluster alone. The calculations below show that in the correlation (factor analysis) a relative relationship among variables and cluster analysis assesses an absolute relationship. A more detailed inspection of the analysis will demonstrate the differences. The following jobstream and output shows how the correlation and factor analysis operate in relative terms. COMPUTE T1LX = TEST1 ‑ 2.5. COMPUTE T2LX = TEST2 ‑ 2.5. COMPUTE T3LX = TEST3 ‑ 5.5. COMPUTE T4LX = TEST4 ‑ 2.5. LIST T1LX T2LX T3LX T4LX . LIST T1LX2 T2LX2 T3LX2 T4LX2 T1LXT2LY T1LXT3LY T1LXT4LY. And one more example of the relationship between TEST1 and TEST4. In this instance TEST1, TEST2, and TEST3 are similar while TEST4 is different. A look at cluster analysis tells a different story. COMPUTE dif12 = TEST1 ‑ TEST2. COMPUTE dif13 = TEST1 ‑ TEST3. COMPUTE dif14 = TEST1 ‑ TEST4. LIST dif12 dif13 dif14 dif12s dif13s dif14s. There is a difference in profile but also a difference in that profiles can be opposite and still be a part of the same factor (negatively related to the factor). It might be useful at this point to compare and contrast the various statistical procedures used in this set. From a practical point of view different techniques were selected and it might be useful to note why they were selected for the various questions. This chapter is provided to show similarities and differences between the various statistical procedures. 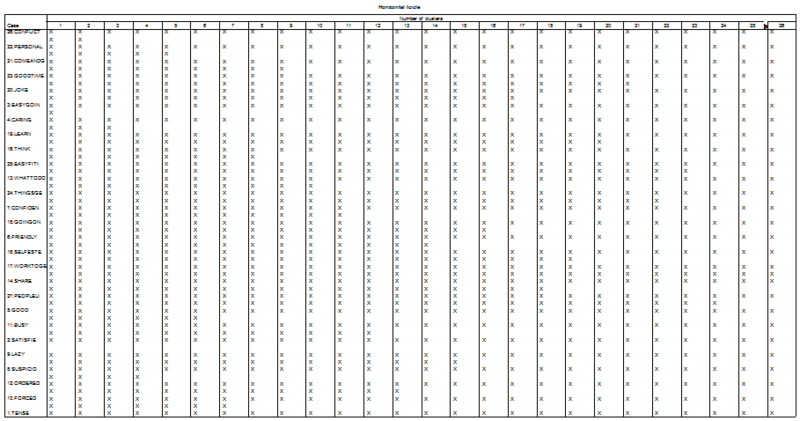 This data was part of a graduate student class assignment for students taking a theories of personality class. Each week the students read the assignments and completed the questionnaire the day before the class meeting. There were 17 students enrolled in the class, however, not all students complete the forms each week and consequently there is some missing data. There were ___ completed forms. In this first example the items of the questionnaire are grouped using factor analysis. Recall that in this condition the items with similar profiles will be grouped together (into factors); not necessarily the items that are closest in distance (refer to the above discussion). The data is in a dBase IV file with 9 indicating that data was omitted. As can be seen mostly defaults were used in the computer run (see Frame PERFAC5.SPS) and a principle components extraction method was used and the rotation was orthoginal. Using the eigenvalue of 1.00 is usually not considered the best method of deciding upon the number of factors; however, both interpretation and the scree method seemed also to indicate 5 factors. DATA PARSI FREE THERA PATH AGREE . missing values drive to agree (9). We were somewhat arbitrary in selecting 5 factors in this solution so that it would match with the five cluster solution in the cluster analysis solution that follows. It should be noted that one should not be so casual in determining the number of factors in a solution; the reader is referred to chapter __ when testing for the number of factors. In developing theory the researcher may do that in an armchair fashion, reviewing the literature or with exploratory factor analysis. The major purpose here to compare factor analysis with cluster analysis so that the number of factors is done with that purpose in mind. The factors in Figure __ are presented in two ways: (1) the criterion of .60 is used to determine whether a variable loads on a factor, (2) if a variable does not load on any factor then it is placed on the factor with the highest loading. 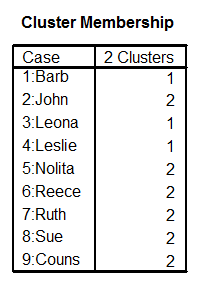 The next example shows how cluster analysis can be used to group the same set of data. The data needs to be conditioned before the cluster analysis can be run. The means are computed within each theorist for each item. For example, the first item DRIVE for all respondents to Freud were summed and divided by the number of respondents (the number was also rounded to the nearest integer to keep it on the same scale). The matrix was then transposed because the computer program requires that format for this problem. This data is presented in the frame THER11.sav. SULLIVA BANDURA CATTELL MASLOW BINSWAN ERIKSON.